My Soundcloud Mix February 2017 is available! My Soundcloud Mix Series is back with 17 fresh tunes mixed into just one hour! It features tunes and remixes by artists like Scott Bond, Christopher Lawrence, Greg Downey, Lostly, Allan Morrow and many many more! Stream+Download enabled, enjoy! Tic Tac Trance #110 Replay available! 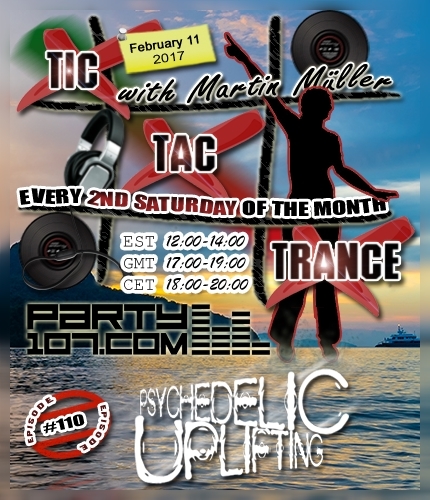 Tic Tac Trance returns on February 11 2017 with episode #110 on Party107.com. You can expect for this show a 2 hours uplifting & psychedelic underground trance mix which features tunes of labels like Perfecto, Flashover, Digital Society, Pure Trance, VII and many, many more! Make sure to tune in!